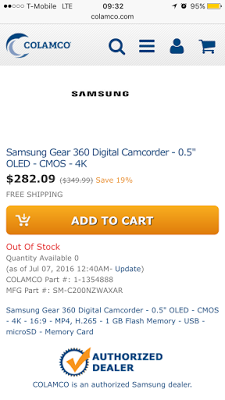 Florida-based retailer Colamco probably has the lowest price for the Samsung Gear 360 anywhere: $282.09 with free shipping!!! Here is the link. Yes, they’re an authorized Samsung dealer. It’s currently out of stock, but when I called them, they said you could still order. It would just be a backorder. They said they would have stock at their Fresno, California warehouse by July 23. It’s possible that may also be the US release date!